In the first few weeks of using a spam filter, we know it's an inconvenience to have to approve senders when it would be obvious to anyone but a computer that it's mail that you want, but you'll be grateful to have the spam filter when you see all the clutter gone from your mailbox. Note that what appears in your quarantine is only the borderline spam content and that the rest of it is blocked in a "black hole". On average, across all the clients we actively manage, around 80% of all incoming mail is blocked or quarantined as spam! Here's a question we get a lot: "I delivered a message from my spam quarantine, but the next time the person sent a message to me, it wound up in my quarantine again. Why?" There are actually two steps to the process: delivering and approving. When you receive your daily Quarantine email (we typically program delivery for 8am daily), you'll see a list of emails that were quarantined in the last 24 hours. This list can be quickly scanned for "false positives", that is, emails that were flagged as spam, but may be things that you want. From this email, you can quickly hit "deliver" to get the messages you want sent to your "inbox" by simply hitting the "deliver" link. When you do so, you'll see a web page pop up that will say "Your message has been delivered. Close this window". At this point, the message you selected should have been successfully delivered to your inbox. However, if you notice that it's from a sender that regularly emails you (such as an enewsletter, an important customer, a sales promotion, etc), you'll want to take an extra step to "approve" the sender so their mail always gets through. For example, I definitely always want to know when Lands End is having a sale. Their messages are commercial bulk mail, which is considered "spam", but since I always want to receive the mail, I need to "approve" the sender. To "approve" a sender and not have to click "deliver" every time they send a message, click on the "Message Center" link directly above "Date" on our list of quarantined spam. 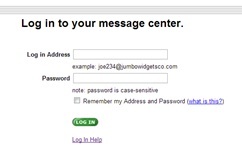 This will directly you to a screen to log in to the message center. Your "Log in Address" is simply your email address. The password is the password originally assigned in your welcome message when the account was created (not the same as your email password), but don't worry if you don't know what it is. Simply type anything into the Password box, and then you'll see a message "Invalid Login. Please try again" and you'll also see a link "forgot your password?" directly underneath. If you click on this, you'll be directed to a page to reset your password. In our experience, people often don't log into the message center frequently, and they often forget their passwords, so this is a question that comes up often. Don't worry, it's easy to correct. After you're logged into the message center, you'll see a list of all your quarantined spam messages, but unlike your quarantine email, you'll also have a lot more functionality available through several links. When you're logged into the message center, you can select one message on the left and hit "Deliver" (button on the right), or you can select multiple messages and hit the "Deliver Selected" above all the "Deliver" buttons. As always, if you have questions or need help, let us know!